My brother had Peter Line's 2001 model snowboard, and when i tested it out last season it was definetly love at first ride. The only thing i didnt like about that board was the I-Lock mounting system and the fact that it delaminated in just the second season of riding it. This season I decided that even though that was my dream board, i wouldnt buy it because (1) expensive (2) I-Lock mounting system (not dependable) (3)quality and disposability. Basically, it rides like a beauty but could use work on its construction and design features. I board shopped for weeks in hopes to find a "twin", and one day i just stolled into a skate shop which happened to not only have the Forum Division (Peter Line's pro-model) in my length (151),but with the Inserts 4x2 instead of the I-Lock (they now provide the option), a great price, and it was autographed by the great Peter Line himself (my fave rider). It seemed like destiny, but i decided to wait on it and research my other options as well as the construction and design features that forum was providing for this seasons boards. Wow. Forum has made a big turnaround. The Peter Line Model, or Division, this season is so high quality and super durable, with awsome features like the Quadrax w/ Carbon Matrix and the Sintered 7500 Structurn base structure, plus a 1 year warrenty. . .you cant go wrong. Why the sudden improvement in quality without jacking the prices up you may ask. Forum has always had the technology but not the funding to actually utilize it in their boards. Last August Burton company bought Forum for their innovative technology, and now that Forum has the financial backup, they are able to go all out on their boards. Well, I took it out this past weekend, and i swear this board has completely revolutionized my riding abilities. W/ the same amount of effort i put into my old board i got twice as much air on the kickers (amazing pop), the brand new edges didnt catch on the rails, and rides so fast and smooth. This board is great for power riders who ride hard in the park and love to go fast on the mountain. I can't wait to take this thing through the backcountry and a pow-day. I was hooked up! Compared to all the other places i went to check out boards, this guy really knew his stuff. At other stores, i think i knew more about the boards i was lookin at than the sellers themselves, but then again, what can you expect when you live in the smack middle of Arizona. At Axis Sports the guy was super cool and blew me away w/ his knowledge and know-how. Let me tell you something, NEVER let a salesman tell you what kind of board to buy, do your own research ahead of time by reading magazines, reading reviews like this one (very smart), and even if you dont know what you want in a snowboard just go to a search engine and type "how to buy a snowboard" and you will find some superb information about snowboard construction and design and what features to look for in finding a board that best suits your riding ability/style. I went into this store knowing what board i wanted, and the salesguy only reinforced my opinion. I was hooked up with a sweet deal on the board, and they mounted on my bindings and threw in an autographed cardboard cutout of peter line because they knew i was a huge fan - all free of charge! 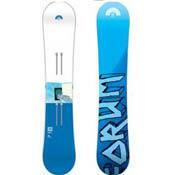 My old board is a Burton Motion 147 i bought like 4 or 5 years ago. Burton discontinued making them, but its a great quality and very durable board that has done me well on my road to progression. It is still in superb condition but i had to lose it because its a pretty heavy board that has no pop whatsoever and directional twin shape design and flex pattern.